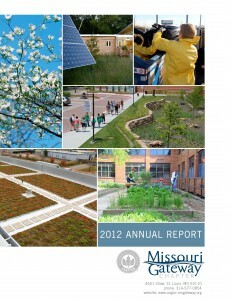 USGBC-MO Gateway 2012 Annual Report Now Available! Learn more about USGBC-Missouri Gateway Chapter and what we were up to last year from our 2012 Annual Report! View or download the full report here! In partnership with St. Louis Green and RainReserve, St. Louis’s annual rain barrel truck-load sale is coming on July 27th and 28th! Collected for non-potable use, rainwater is a free resource that would otherwise contribute to pollution and erosion in local waterways. Last year’s drought was a stark reminder about the importance of conserving water. Rain barrels are a time tested gardening technique for collecting non-potable water, and are popular among even novice gardeners. Just one-quarter inch of rain on a 400 sq foot roof space is enough to fill a rain barrel! 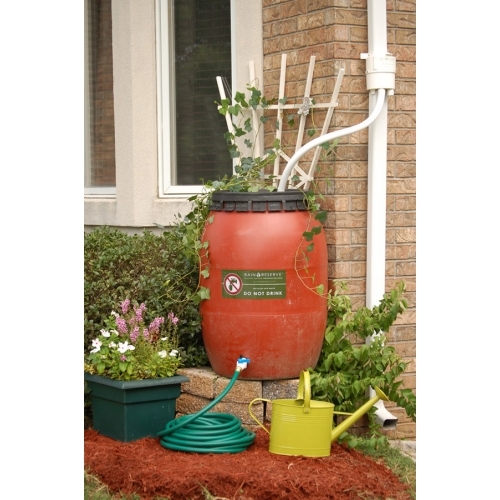 The complete rain barrel systems available at the event will feature re-purposed 60 gallon barrels available in four colors (Gray, Dark Brown, Dark Green and Terra Cotta) and a RainReserve diverter made in Missouri. USGBC member, Ralph Wafer, was featured in the St. Louis Beacon recently for his work on a local passive house. The passive house, located at 1455 Gregg Ave in Dogtown, is the first of its kind in Missouri. Wafer worked as the energy consultant on the home, which uses of window placement, shading, and insulation to create an environment that requires very little additional climate control. As stated in the article, passive homes are highly effective at retaining heat, and are therefore most popular in cold climates. They have been slow to catch on in Missouri, due to warm summers and low energy costs, but this home will help to raise awareness in the community about energy efficiency and the potential of passive homes. You can read the full article here. In preparation for the Sustainable Tower Grove – Power for People project, the Southwest Garden Neighborhood Association is seeking qualified vendors. Sustainable Tower Grove is a Pilot Project for a Sustainable Energy Cooperative Purchase Program, where residential and commercial property owners can participate in purchasing specific technologies that assist with both renewable energy production (solar power) as well as energy efficiency (white roofs and energy audits). The program will significantly lower the economic barrier that exists for many to purchase these technologies, as well as provide a focused campaign to educate consumers on the technologies themselves and the economic benefits of a cooperative purchasing program. As part of the program, Sustainable Tower Grove is inviting proposals from qualified companies to be the sole contracted providers for design and installation for all Power for the People residential and commercial Solar Reflective Roof systems, solar systems, and energy audits. Why benchmark your building? How to accurately benchmark? What are the benefits of benchmarking? The BOMA Green Committee has developed this timely educational session on how to accurately benchmark the energy performance of your building and how to use that information to differentiate your building. Information regarding the recently updated Energy Star Portfolio Manager will also be discussed. Parking and breakfast will be provided. Please park in the Stadium West Garage off of 8th Street. Class size is limited . . . register today!